I believe that most golfers, especially recreational golfers, see the golf season starting the week of the Masters. Jim Nantz says the Masters is a “Tradition Like No Other.” Thanks to a joint effort (by the Augusta National Foundation, the USGA and the PGA), the Drive, Chip & Putt Finals is creating its own tradition and brand “like no other” the Sunday before the Masters. 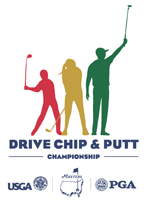 The great news is that PGA golf professionals can use the Drive, Chip & Putt (DCP) brand at their own facility to create a “Drive, Chip & Putt Prep Clinic” product. Our partners in DCP now understand that if the number of kids participating in the program is going to grow, it will be because of PGA Professionals. Provide a fun, exploratory experience for the youngest kids at your facility, while engaging families. Use this program as a way to jump-start your golf season and get those golf families out of “hibernation”. Weeks 1-3: Teach, coach and help kids (ages 6-14) develop the fundamentals of DCP during the first three weeks of prep clinics (Click here to view the DCP Coaching Manual.) 90-minute clinic sessions on DCP fundamentals recommended. In conjunction with kids’ DCP experience, you could also run an event for your men’s, ladies’ and related clubs. This could be key in getting your core players out and playing early this season! DCP could also be a way to get kids/families involved, then introduce them to your PGA Junior League Golf program. I suggest weekend afternoons (Sat or Sun) with a max student : teacher ratio of 12:1. Start your first session within 1-2 weeks after the Masters. * For private facilities: I recommend the following: Guests welcome; fee is the same OR charge more with difference going to “Guest Fees Line Item”; but guests not eligible to win the DCP Club Championship. Interested in learning more about DCP, Junior League Golf or how to promote your programs better this season? Please contact me today.